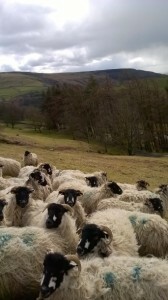 Last Sunday was a stressful day as we have started lambing, and I had the job of sorting fat lambs out to take to the collection centre at Pateley Bridge Auction Mart. The biggest problem was when I went round the gimmer hoggs, I noticed there were six not eating and looking unwell. (A gimmer hogg is a female lamb born last year). After I had told my Dad, he went round another packet of sheep and he found another three hoggs not eating. The problem was they had got out of the field that they were in as someone had not fastened the gate correctly the night before. Unfortunately they managed to get into someone’s garden full of Rhododendrons. The hoggs had decided to eat some and Rhododendrons are poisonous to sheep which explained why the hoggs were not eating. My Dad rang the vet up and told him what had happened, he said we had to make them sick to get rid of the Rhododendron leaves. The only thing is, it is very difficult to make a sheep sick! The hoggs that weren’t eating had to have strong salt water and cooking oil in a bottle to try to make them sick. The salt water was to make them sick but the cooking oil was to try to get their stomachs working. This however was very difficult and there was only one that was sick and really emptied its stomach. The rest were sick very little. My Dad gave them the salt water in the morning as well as a jab of Alamycin LA which is an antibiotic that lasts for 3 days and also a jab of Metacam which is an anti-inflammatory. Whilst my Dad was sorting the poisoned hoggs out my brother and I were sorting out fat lambs that were ready to go to slaughter. We do this by grading the lambs and sorting out the fittest. This is done by the size of the lamb and how much fat the lamb has on its back. We put the lambs into a pen so we can catch out the ones that are ready to go. The thinner lambs are caught out and put back into the shed and the ones that are ready for off are put into the cattle trailer. We normally take around 50 weighing between 39-47kg depending on the breed of the lamb. When we get to the auction the different breeds are weighed separately, these are Texel x, Mules and horned, normally 10 lambs are put onto the weigh bridge at once. Depending on the time of year we normally get rid of the Texel lambs before Christmas along with some Mules and horned lambs start going from January. 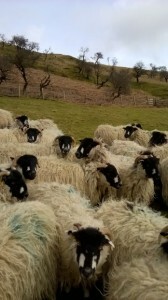 The horned lambs are left until this time as before Christmas as there are too many white faced lambs around, and the prices are lower as a result. The lambs don’t seem to be weighing the same this year, we think it is down to it being so wet, as other people seem to be saying the same thing. Normally we don’t have a lamb under 40kg but there are plenty this year. After dinner I went back round the hoggs to see if any more had become unwell and there were another two. The most poorly one that my dad had treated in the morning had died. Later on there was another dead one, and she hadn’t seemed as unwell as the rest of them. After all the ones that we had treated we lost 7 in total. Even those that seemed to be recovering and looking a bit brighter died the next day. It would be very helpful if people fastened gates correctly as if sheep get out of a field they could get into a garden which could have poisonous plants in. Many people are unaware that certain plants can be very dangerous to livestock.